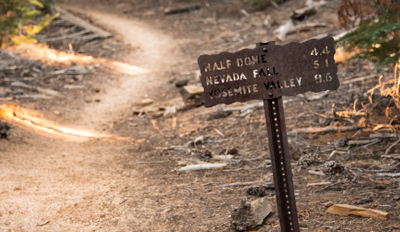 Browse: Home » Hiking the John Muir Trail in 2014? Here’s what you should be doing now. 4. Join the Yahoo John Muir Trail Group. There is no better source of current information on the trail. 5. Decide when you are going to hike. This will allow you to make reservations for accommodations in Yosemite Valley on the night before you begin your hike. 6. Settle on your plan on how to secure a permit. More on wilderness permits can be found here. Once you join the Yahoo JMT group you’ll be privy to a folder called “Permit Trailhead Options”; there’s gold in there. 7. Acclimatization planning. If you live at low elevation, you need to have a plan to spend some time to adjust to the thin air and low pressure of the back country. Yosemite Valley isn’t bad, but it is only 4,000 feet. A better choice is Mammoth Lakes, which is at nearly 8,000 feet. 8. Transportation. Start figuring out how you are going to get from home to the trailhead, and from trail’s end to home. 9. Dress the part. Buy a JMT shirt so that everyone knows you’ve decided to hike this hike. 10. Commitment. Most importantly, make a commitment to yourself that you are going to prepare for and hike this hike. There will be plenty of obstacles to overcome in the months ahead; decide NOW that you will not be stopped. I’m planning for 2015 myself, but this is great advice, some of which I’ve already followed! You’re the best, Ray. Thanks! I’d add trying to limit weight gain between now and Jan 1 and then (for many people) trying to shed 10 lbs or so. It takes about the same amount of effort to carry an extra 10 lbs on the gut as an extra 10 lbs in your pack. Great point, John. Trust me…I’m trying! No better way to lose those pounds than to get out there and hike. Thanks for the post. I’m pleased to know that I’ve already done several of the things on here in preparation for doing the combined JMT and HST in June/July. The things I haven’t yet done will quickly be added to the list. There will be plenty of time to relax at the top of those eight passes, Bob! All great pointers! Your book was the first thing I bought last year. And all along the way, remember to be flexible in your planning! take if from me–3 days before we started, we couldn’t get to our trailhead! We laughed often on the trail about the ‘Kitchen Table Plan’…once you get out there you just can’t help but stop here and there even though it means you have to camp somewhere other than planned! Thanks so much Ray for making such a thorough and inspiring blog. 2014 is definitely my year! I lived in Yosemite back in the early 90s and it was truly one of the best experiences of my life. Worked some crappy jobs (Happy Isles before the rock slide) and some great ones (ice rink, and Tuolumne Sidehall cook) but I got to live there and, as girl from Louisiana, I had never seen a place so absolutely stunning. I thanked my lucky stars everyday. But then life got in the way of life, I moved on from the mountains to the big city, and I realized I had only been in the park twice, maybe three times since I’d left in 96. I live on the east coast so it’s not exactly close. But then last summer visiting some friends in Cali, I said screw it, I’m here! I’m gong to Yosemite. So, I borrowed some gear and hiked a quick overnighter on the Young Lakes loop. I was so in awe of the beauty and majesty of the Sierras but at the same time t was like hanging out with an old friend. Right then and there I decided I was gong to thru-hike the JMT. I’ve been planning ever since. Your blog has been a great resource! Thanks so much! Thanks for the comment, Stephanie. So much of what your write rings so true. I, too, grew up east of the Rockies, so when I discovered Yosemite it stuck with me forever. And the Young Lakes area is one of my favorites in the park. Good luck this year! Love this resource ! Thank you , Ray! Did 80 miles of JMT last summer and plan 80 more this. Last summer my 60 year old feet were aching. I need sturdier boots this summer. Any suggestions for women’s boots? I carry about 27 lbs. First of all, Jane, congratulations on getting your pack down to a reasonable weight! Reducing pack weight will do more to keep your feet happy than just about anything else. More on JMT footwear, here: http://jmtbook.com/john-muir-trail-gear-footwear/. I wrote this before my second thru-hike, and I still stand by every word.